And you thought an $8000 action figure collection was impressive. 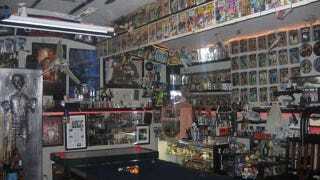 A man from Waco, Texas is selling an enormous lot of Star Wars merchandise on Craigslist, which he began collecting in 1977 and which he says has been valued at over $120,000. Included in the sale are a life-size statue of Han Solo frozen in carbonite, "all" vintage figures (with nearly 100 "mint on card"), a pinball machine, autographs from Star Wars cast members, expensive replica props/toys and more, so much more there's "too much to list". Is it all actually worth the $35,000 that's being asked? Who knows, a collection is worth only as much as someone is willing to pay for it. If you think that's you, the listing is below, knock yourself out.